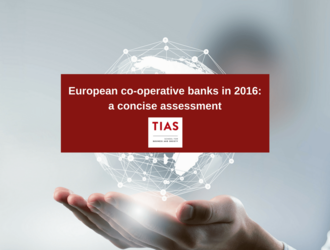 The EACB is pleased to announce the launch of a new publication entitled “European co-operative banks in 2016: a concise assessment” by Tias School for Business and Society at Tilburg University. The publication reviews developments in the overall performance of 17 co-operative banking groups in 12 European countries based on consolidated financial indicators pertaining to 2016. "This research letter aims to provide policy makers, regulators and scholars with an aggregated overview of this specific sector. Collectively, these groups extended their member base by 1.6 million people and gained market share in domestic retail banking. In 2016, according to key financial metrics, co-operative banks performed differently compared to all other banks. On average, co-operative banks supplied the real economy with more new loans, improved their capitalisation and realised a higher return on their capital and reserves.Their efficiency levels deteriorated to a somewhat larger degree." H. GROENEVELD, Author, Professor at TIAS University of Tilburg. • The long term trend of an expanding member base continued in 2016: co-operative banks welcomed 1.6 million new members. • According to some key indicators, the financial performance of co-operative banks differed from those of all other banks in 2016, e.g. loan growth, Tier 1 ratio and efficiency ratio. This contrasts with the general picture emerging from the 2015 data. In this respect, co-operative banks apparently contribute significantly to diversity in banking. • In 2016, total assets of co-operative banks grew by 2.1 per cent and those of entire banking systems contracted by almost 1 per cent. Co-operative banks expanded their loan portfolio by 2.5 per cent. The loan volume of other banks shrunk by almost 2 per cent. The substantially higher loan growth at co-operative banks demonstrates their close ties with the real economy. These balance sheet developments were somewhat influenced by the drop of the British pound in 2016. • Just as in 2015, the average return on equity (ROE) of co-operative banks amounted to 6 per cent in 2016. The ROE of all other banks decreased from 6 to 4.3 per cent. Over a longer period of time, the ROE of co-operative banks exhibits a more stable pattern. This is probably due to their member-based governance which leads to a focus on retail banking. This type of banking generally results into more stable revenues. The analysis also looks at other indicators including market shares, cost/income ratio and Tier 1 Capital. The TIAS Publication concludes that co-operative banks engage in fewer and more stable business which secures stability in their performance. The impact of (new) banking rules varies across banks with different ownership structures. Regulatory measures should not enforce convergence of business models and /nor the introduction of aspects of listed banks into well-capitalised co-operative banks with viable business models.